Solon property owners rely on CleanGlo Services LLC for effective tile and grout cleaning. Having been in business since 1996, the technicians at CleanGlo Services LLC know the safest, most effective ways to remove all the filth, mold, mildew, and grime out of your tile and grout. Grout is a porous material that easily stains. In rooms that see high humidity/moisture (like the bathroom), grout can develop mildew and bacteria. This mildew and bacteria not only looks filthy, but leaves an environment unhealthy. 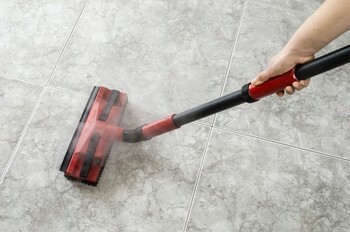 Keep your tile and grout clean for a happy and healthy living and working environment. We use professional grade grout cleaners to remove dirt and mildew, without harming the grout, leaving your surfaces looking as good as new. With our powerful cleaning tools, and our highly trained technicians, we will do a thorough job of cleaning your hard flooring. By keeping your floors clean and healthy you can extend the life of your flooring; this means you save money in the long run by making the floor you have last longer. Having clean floors even improves the air quality inside your business. With our state-of the art equipment exceptionally trained professionals every inch of your floor will be cleaned in detail. It's time to restore your floors in your Solon Ohio property. Call CleanGlo Services LLC now for your tile and grout cleaning services.